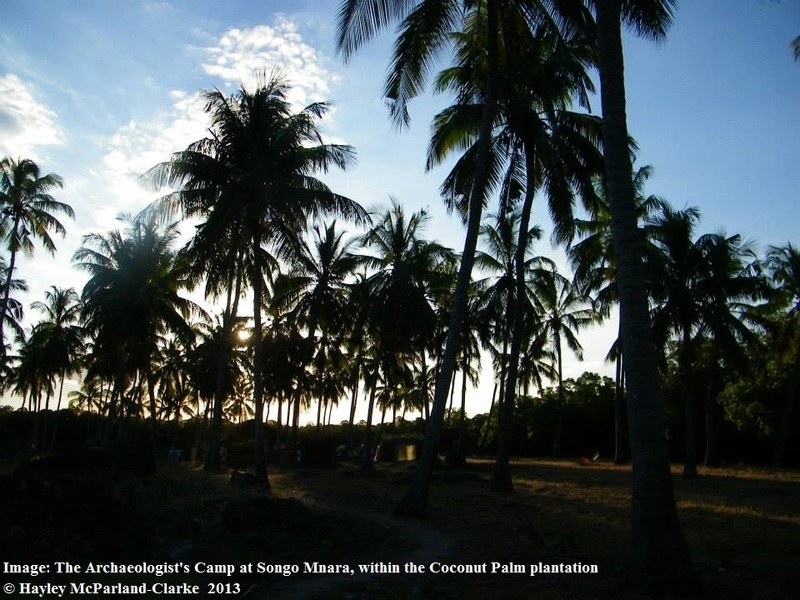 Songo Mnara is not as easily accessible as Kilwa Kisiwani; travelling by boat from the port at Kilwa Masoko we approached a picturesque fishing village at Sangarungu, palm frond makuti structures emerging from a clearing within the mangroves and palms on white sands. Sangarungu is a working fishing village and despite the seemingly remote location by British standards, there’s a small shop for the fishermen selling Fanta Passion and other supplies, ice is shipped from the mainland to preserve the recently gutted fish on wooden platforms just off the beach. This route is only accessible in low tide as the boat moors just offshore, so you have to wade to the beach. Passing through Sangarungu, white sand stuck to our wet feet as we walked through palm plantations and mangroves, curious monkeys crashed through the trees, just out of sight. 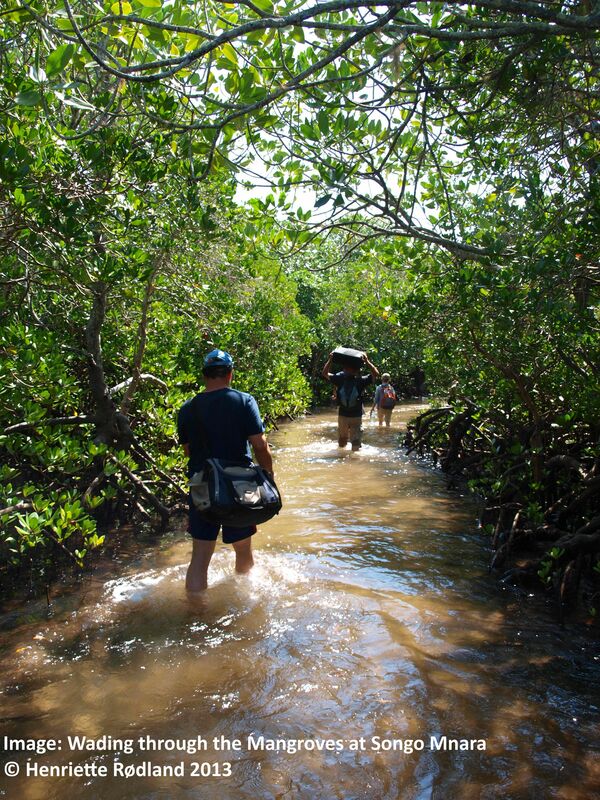 The sandy path sloped downwards into the Mangrove swamp, the barrier between the sandy island of Sangarungu and Songo Mnara; at low tide we walked down into a cutting, into the dense shade of the mangroves, twisted roots emerging from the sand. We waded through the shallows for 150m to Songo Mnara, to the sound of water being pushed violently ahead by our legs, solitary mangrove fruits floated past poised to anchor into the sand and fill in the gap left by the cutting. 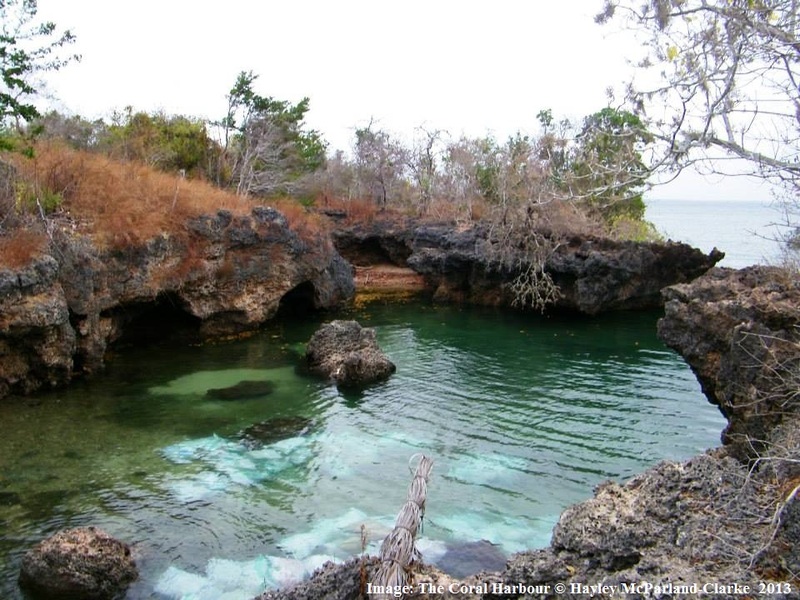 The brave and adventurous might try to keep their shoes on and their feet dry at low tide, by traversing the mangrove roots at the edge of the path. 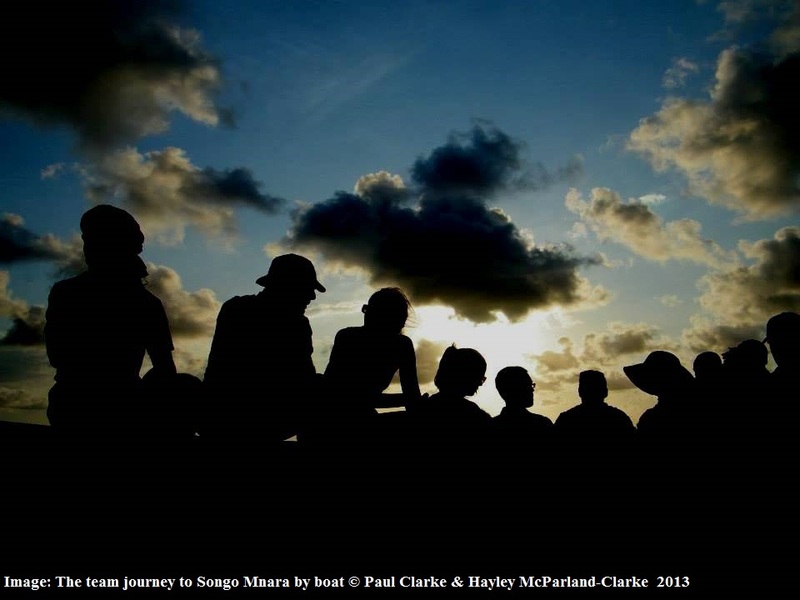 At higher tide, we waded into chest deep clear water, despite the organic blackness of the mangrove sediments; carrying our bags on our heads to keep them dry as small shoals of fishes swam past. Emerging on white sands we reached Songo Mnara, on the very edge of the intertidal zone. 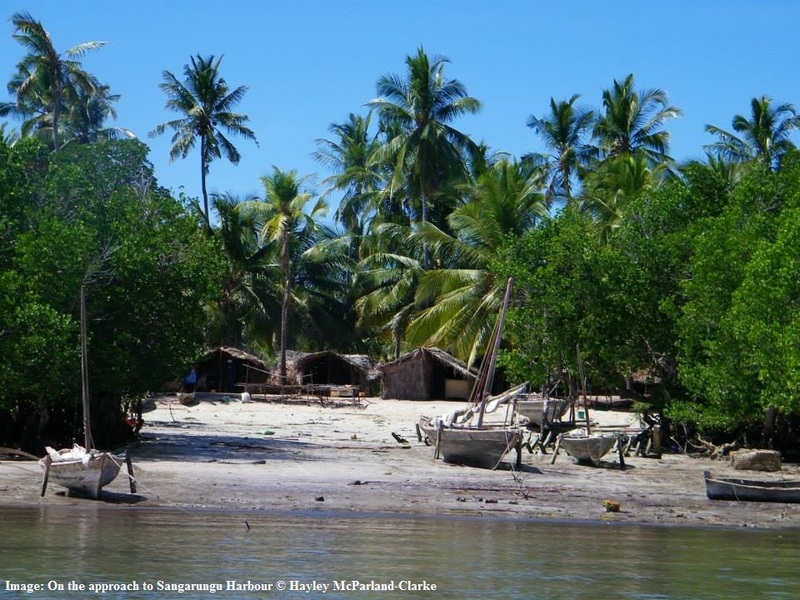 At high tide, when the tide is too high to wade through the mangroves from Sangarungu, we instead approached a shallow cove of clear blue water to the north of Songo Mnara. Coral rocks cropped up through the water hiding small shoals of small black and white tropical fish, mangroves, visible at low tide, peering through the waves, protecting the natural inlet; we scrambled from the side of the boat up the coral bluffs, entering through a thicket, emerging onto white sands studded with tall Coconut palms. 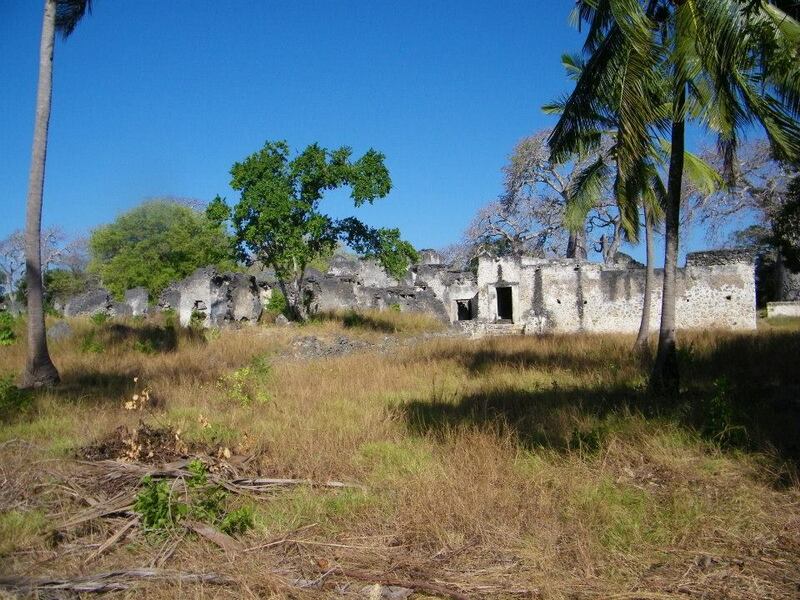 The ruins of Songo Mnara lie on the edge of a large Coconut palm plantation, pale grey ruins surrounded by lush green vegetation. At first, you can barely make out the crumbling coral walls peering through trees and lianas, but then you begin to see the walls emerge, picking out buildings, seeing the city develop before your eyes. Every now and then, a loud crack punctuates the silence, as a Coconut palm branch falls. 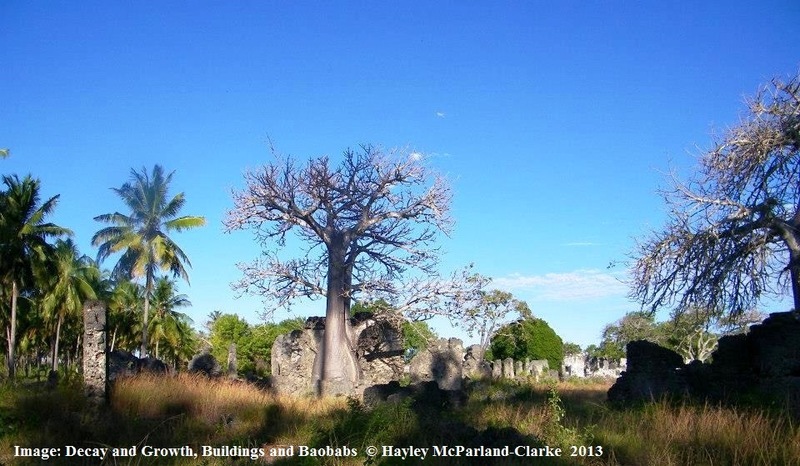 Whilst the abandoned buildings decayed, huge Baobab trees sprung up next to the ruins, growing stronger, almost eclipsing the monumentality of the buildings; introduced by the inhabitants of the buildings, their presence is a natural reminder that this was once a busy urban trade town.